In 2018, Will Dean captured the attention of crime readers around the world with his chilling debut, DARK PINES. Now, he’s back—and his sophomore novel is even better than his first. In RED SNOW, readers return to the fictional town of Gavrik, Sweden, and to all its glorious quirkiness and personality. But there’s something sinister happening in this quiet town. First, a suicide; then, a gruesome, almost ritualistic murder—what could be next? Rejoining series protagonist Tuva Moodyson, a reporter for the town’s local newspaper, readers will go down the rabbit hole and into the twisting, turning case of “the Ferryman,” a killer so named due to the licorice coins he placed over the eyes of his victim. RED SNOW is, as expected, a highly atmospheric and chilling thriller. But even better is what I didn’t expect this story to be, and that is a touch zany and brimming with personality. Dean masterfully laces his crime novel with quirks and quiet jokes galore; this isn’t a comic novel by any stretch of the imagination, but it is a crime novel with a dark, eccentric sense of humor. (Fans of Twin Peaks, this one’s for you.) RED SNOW is a fresh take on northern crime fiction, guaranteed to deliver thrills and a few laughs along the way. RED SNOW is not, in my mind, technically Nordic Noir—but it sure does encapsulate some of the essential elements of the genre: namely a Scandinavian location (obviously!) and a rich, immersive atmosphere of chill and gloom. Author Will Dean lives in rural Sweden, in a location that I picture as being quite similar to Gavrik, the fictional town at the heart of this story—and I believe it’s his personal experience with life in rural Sweden that lends RED SNOW its authenticity. The remote, wooded backdrop to RED SNOW lends this story an innate air of mystery; if ever there were a story that begs to be read in the winter months, RED SNOW would be it. With sub-zero temperatures and pitch-black nights, the atmosphere of this book is nothing if not chilling. However, Dean brings to his crime novel a levity that diverges a good bit from classic Scandinavian crime, at least to this reader. This is a dark story, yes, but it doesn’t have quite the same grit or density of a Scandinavian crime novel—a distinction which may in fact be a plus to readers who find Scandi crime a bit unrelenting in its darkness. Instead, Dean injects RED SNOW with humor, quirky characters, and details of small-town life. The crimes here may be dark, and the atmosphere may be darker still, but there’s a vivid personality to RED SNOW that is its true focal point. At the heart of RED SNOW is the town of Gavrik and its motley cast of characters. You may not be able to find Gavrik on a map (it’s a fictional town, after all), but it will feel vivid and real to the reader. In Gavrik, Dean succeeds at creating a place that feels both true to and larger than life. Beneath its chilling mystery, RED SNOW is, on a fundamental level, a case study of small-town life—and it’s here that Dean’s writing shines most of all. Through her investigation of the Ferryman case, Tuva finds herself drawn into the inner workings of Gavrik’s social structure. And when she also accepts a job researching the town’s wealthiest family for a book being written about their history, she begins to discover that those inner workings - and the secrets they hold - are stranger than anyone could have imagined. Dean’s storytelling shines in the men and women who fill the book’s pages. The Grimberg family, pillar of Gavrik’s social structure and owners of the Grimberg licorice factory, which in turn drives the town’s economy, are surreal characters: individuals with hobbies and secrets eccentric enough to be drawn from a Lemony Snicket story. My favorite scenes of RED SNOW were those spent in the Grimberg’s expansive, half-abandoned home; from its attic full of mannequins to the bizarre artifacts housed in its cupboards, the building is a treasure trove for readers who love the eccentric and slightly bizarre. But these characters aren’t caricatures; they are empathetic, vivid people who will capture the reader’s imagination and heart. Every moment spent in their company is a moment well-spent. Of course, a crime novel wouldn’t be complete without a compelling mystery for readers to solve, and Dean delivers exactly that in RED SNOW. At the heart of this book is a disturbing crime: a man is found brutally murdered in the Grimberg licorice factory, his body displayed in an almost ritualistic manner, his eyes covered with Grimberg licorice coins. The shocking and bizarre display earns the killer the name of “the Ferryman” - an ode to the ancient practice of placing coins over the eyes of the dead, to pay for their passage into the afterlife. In a town as small as Gavrik, word (and paranoia) travels fast, and Tuva quickly finds herself in the midst of a storm of suspicion and fear. The Grimberg licorice factory, a cornerstone of the Gavrik community and economy, is thrown into disarray; workers are in a panic, and the town becomes increasingly on edge. Tuva herself is preparing to move away from Gavrik and down south, to a new job in a larger town in Sweden—but before her time in Gavrik is up, she has one last assignment: to report on the Ferryman killing. Our intrepid Tuva, never one to shy away from a challenge, dives headlong into this disturbing case… and quickly finds herself not only in over her head, but a potential target of the killer himself. 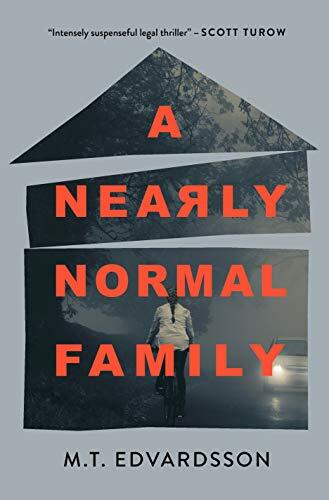 Dean writes a slow-burning yet engrossing mystery, one which unravels with intentionality and plenty of spine-tingling chills. One point which I do want to raise: because RED SNOW is so heavily focused on small-town life, readers expecting a big, sweeping story may find this book a bit too narrow in scope for their tastes. That’s not a negative at all; the flipside of that coin is, of course, that readers who love detailed portrayals of rural communities will find RED SNOW right up their alley. It’s simply a matter of setting expectations. Because the town of Gavrik has such a small population, and is physically so limited in terms of number of locations in which for scenes to take place, RED SNOW is an inherently claustrophobic and tightly-knit story. But in that claustrophobia, Dean does a superb job capturing Tuva’s own relationship with the town; as an outsider herself, Tuva is keenly aware of the repetitive nature of life in Gavrik, and Dean’s writing portrays exactly that to the reader. RED SNOW is another compelling crime novel from Will Dean, further cementing him as a writer to watch. Perhaps the greatest strength of Dean’s writing is his willingness to push boundaries, injecting dark crime fiction with personality and quirkiness, and wrapping it all up in a detailed case study of small-town life. I hate to use the word “unique,” because it is so meaningless in and of itself, but Dean’s writing truly is just that: unique, personality-filled, and quite unlike anything else I’ve read.